Breast Assured-Yes, you CAN still eat while breastfeeding a dairy sensitive baby! There are many questions that come with breastfeeding a dairy sensitive baby. One of the most frequently questions I hear from mothers needing to cut dairy out of their diet is “What CAN I eat?”. Many mothers think that they will have to live off bland chicken breasts with a few vegetables and fear that they will never be able to do it. I get it; I really do. When my littlest guy was around a month old, I figured out that I needed to cut out dairy; it was too hard on his tummy. I freaked out. No cheese? No butter? I just knew I was going to die of starvation. Little did I know, after a little time researching and trying out substitutions, I would be eating amazing food and even eating chocolate cake. Yes, CHOCOLATE CAKE! I know, I’m your friend now, right?! I started my dairy free journey by, of course, making regular recipes that I knew didn’t require dairy. Next, I sought out dairy free recipes and then finally dove into trying out substitutions. Substitutions is basically making “regular” recipes but instead of using the dairy listed, substituting it with an alternative that is dairy free. I created a Pinterest board with some of my favorites. Note: Some of the recipes on the board aren’t dairy free unless you swap some ingredients and I tried to make note that in the comments on the pin. Along my journey, I also learned that there are a LOT of sources of sneaky, hidden dairy. UGH. Some babies aren’t as sensitive as others. For my guy, I had to cut out ALL dairy. It was very important that I knew what hidden dairy was and how to avoid it. I found many website that lists the alternative terms used for dairy and would scroll through them while out grocery shopping. Lucky for you, I decided to make a handy dandy version that is easy to read. Bonus! You’re also able to print it (high resolution file, baby!) or save it to your mobile device so that you always have it with you. Grab that printable below! Now that you’ve had time to scroll through my Pinterest Board, let’s talk about some of my favorite substitutions. Cheese– I used Daiya cheese and Veggie Shreds. Be careful when buying Veggie Shreds; double check that you get the one labeled Dairy Free. 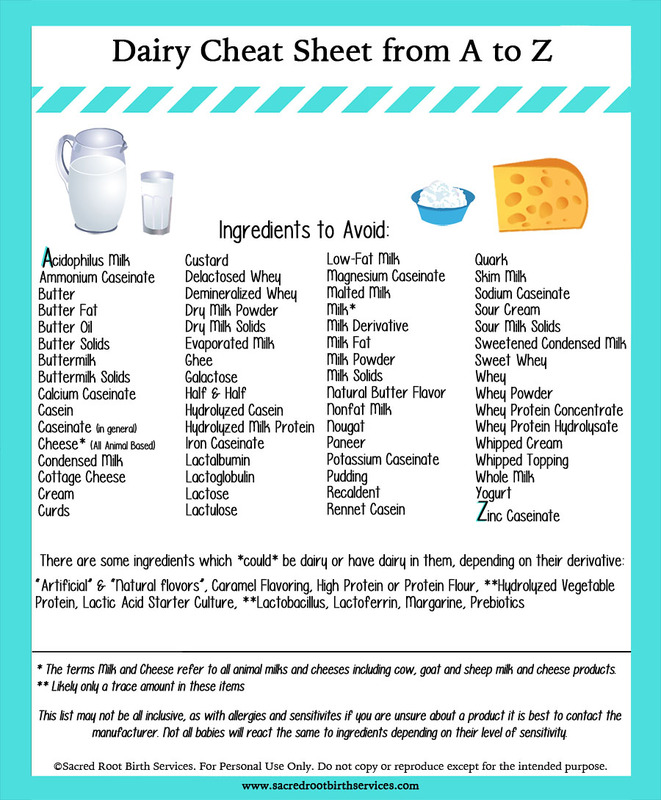 There is one variety that has hidden dairy in it (casein). I’ve recently learned of another “cheese” made by Follow Your Heart that is supposed to be a game changer, but I have not tried it yet. I haven’t looked for it in local stores yet, but I will update when I stumble upon it. Butter– Earth Balance dairy free. I substituted this for butter in a ton of recipes and it never failed me. 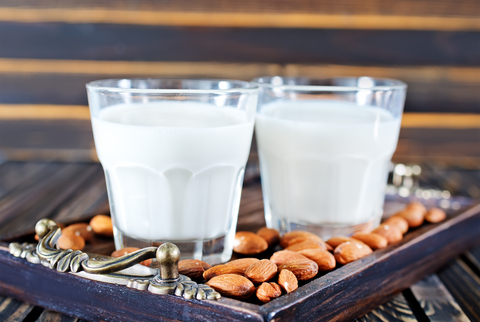 Milk– For the most part, we chose to use Almond milk for our “milk”. I even substituted the plain, unsweetened in recipes and it did well. Ice Cream – SO Delicious Ice cream. They make several different kinds including soy milk, almond milk and coconut milk varieties. One of my favorites was the Soy Milk Chocolate Velvet. YUM-O. That stuff saved me and my sanity, I swear. Almost any item you can think of can be found in a vegan version. It may take a little looking, not to mention shopping around, but it’s worth it to be able to eat somewhat normal. Publix, Whole Foods and Native Sun are just a few of the local stores I shopped at for these items. You may have to ask a store associate where their vegan or dairy free items are; they aren’t always where you would expect. Also, if you’re looking for some awesome lactation cookies check out my friend Katie at Smart Cookies, she can whip up some of THE BEST dairy-free lactation cookies! I do have good news! Most babies outgrow their dairy sensitivity between 6 months to a year. We were able to reintroduce dairy around 9 months and had NO problems at that time! Be sure to comment below if you and let me know some of your favorite substitutions. Have you had to go dairy free for your little one? What was the hardest part for you and do you have any tips for readers who are just starting their dairy free journey?